City in the state of New York; situated on Lake Onondaga. The first settlement of Jews in Syracuse dates back to 1839, when the warehouse of Bernheim & Block served as a meeting-place for Jewish traders from neighboring cities and towns. In 1841 a permanent religious organization was established, with the name "Society of Concord"; services were then held in an upper room of Jacob Garson's house. 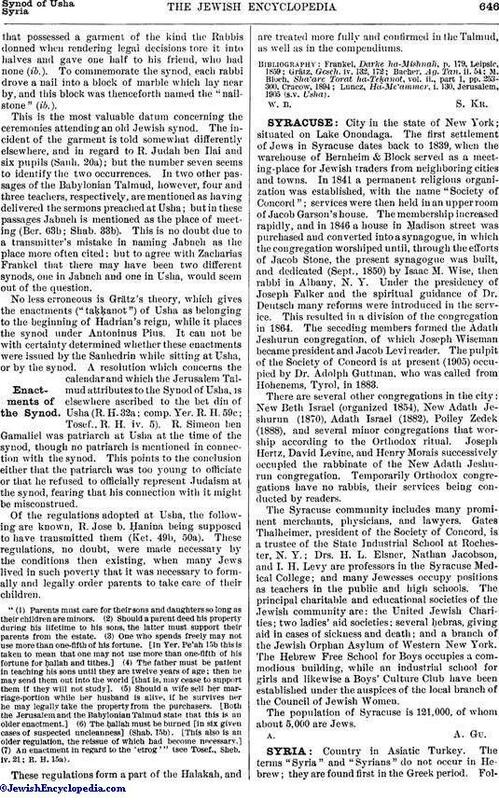 The membership increased rapidly, and in 1846 a house in Ṃadison street was purchased and converted into a synagogue, in which the congregation worshiped until, through the efforts of Jacob Stone, the present synagogue was built, and dedicated (Sept., 1850) by Isaac M. Wise, then rabbi in Albany, N. Y. Under the presidency of Joseph Falker and the spiritual guidance of Dr. Deutsch many reforms were introduced in the service. This resulted in a division of the congregation in 1864. The seceding members formed the Adath Jeshurun congregation, of which Joseph Wiseman became president and Jacob Levi reader. The pulpit of the Society of Concord is at present (1905) occupied by Dr. Adolph Guttman, who was called from Hohenems, Tyrol, in 1883. There are several other congregations in the city: New Beth Israel (organized 1854), New Adath Jeshurun (1870), Adath Israel (1882), Poiley Zedek (1888), and several minor congregations that worship according to the Orthodox ritual. Joseph Hertz, David Levine, and Henry Morais successively occupied the rabbinate of the New Adath Jeshurun congregation. Temporarily Orthodox congregations have no rabbis, their services being conducted by readers. The Syracuse community includes many prominent merchants, physicians, and lawyers. Gates Thalheimer, president of the Society of Concord, is a trustee of the State Industrial School at Rochester, N. Y.; Drs. H. L. Elsner, Nathan Jacobson, and I. H. Levy are professors in the Syracuse Medical College; and many Jewesses occupy positions as teachers in the public and high schools. The principal charitable and educational societies of the Jewish community are: the United Jewish Charities; two ladies' aid societies; several ḥebras, giving aid in cases of sickness and death; and a branch of the Jewish Orphan Asylum of Western New York. The Hebrew Free School for Boys occupies a commodious building, while an industrial school for girls and likewise a Boys' Culture Club have been established under the auspices of the local branch of the Council of Jewish Women. The population of Syracuse is 121,000, of whom about 5,000 are Jews.